We’ve heard the Republican Party wants to re-brand itself to appeal to all demographics, especially Black and Latino voters. In the 113th Congress, there is one black Republican, Senator Tim Scott (R-SC) who was appointed to fill Heritage Foundation President Jim DeMint’s seat. One might call him a token Republican. By definition, tokenism is the practice of making only a perfunctory or symbolic effort to do a particular thing, especially by recruiting a small number of people from underrepresented groups in order to give the appearance of sexual or racial equality within a workforce. When your party is affiliated with semi-white-supremacist groups like the Heritage Foundation, the TeaParty and the NRA, supporters from minority groups will be rare, understandably. The party will thus make a strong effort to use these token Republicans by denouncing the benefits of programs targeted to many of their own racial group. Of course minority Republicans like Senator Tim Scott will deny he is used as a mouthpiece for pet conservative causes: cutting public assistance, lowering taxes on the rich, marriage equality and immigration. Naturally, Scott uses the racist dog whistle of individual responsibility adopted by the Ayn Rand crowd like Paul Ryan who proclaims “inner-city” (code for Black) males are content to NEVER look for a job. This is a disgustingly racist and false statement that Scott parrots when doing softball interviews with Greta Van Susteren. Scott is also vehemently against a woman’s right to choose, and when that woman is forced to have her baby, he is very much in favor of cutting public assistance programs like SNAP and Head Start. Since African Americans are disproportionately poor, Scott is undoubtedly not in favor of giving those folks a hand up. He harbors the opinion that dependence on government is akin to slavery. As if there was any question of his denial of the obvious racism in the South, he was an honorary chairman for one of the re-election bids by the late political icon Senator Strom Thurmond, the staunchest opponent of integration there ever was. He voted to raise taxes on the lowest income-earners while extending tax cuts for the super wealthy. Another rising star of the GOP, who covers the female and black demographic, is Saratoga Springs, Utah Mayor, Mia Love. Mia actually claimed to be an anchor baby because, in her words; “My parents have always told me I was a miracle and our family’s ticket to America.” Her Haitian parents came to America with “$10 in their pockets,” so did they get by without any government help? Ironically, she has aligned her views with other anti-Fourteenth amendment (birthright citizenship) Republicans. In an attempt to ingratiate herself as a true token, she converted to the LDS faith, which has an unbelievable history of intolerance and degradation of black people. When threatened with tax exempt status in 1978, the Mormon Church decided to change their 130 year old thinking that black people are “cursed”and admit minorities into their church. 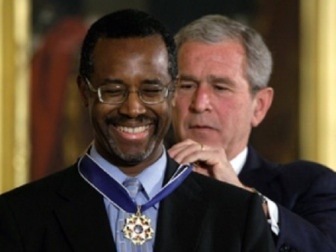 Dr. Ben Carson, a noted neurosurgeon and darling of the Republican party because of his ferocious homophobia, is also guilty of denouncing his own upbringing. Like Tim Scott, Carson derides folks who need support from the government. “Nobody is starving on the streets. We’ve always taken care of them,” Carson said. “We take care of our own; we always have. It is not the government’s responsibility.” Except Carson was a beneficiary of government assistance and is a staunch opponent of President Obama’s every policy, especially insuring poor people. Carson doesn’t acknowledge the higher rates of poverty among African American children. Perhaps the most notorious of Black Republicans is Supreme Court Justice Clarence Thomas. The title of Justice in this case is quite ironic. If I were to expound on his race betrayal, this article would be far too long. Find any minority Republican and you’ll see a person who has turned their backs on the institutionalized disadvantages inherent in our society. Reblogged this on The ObamaCrat™. I saw your post on the Obamacrat and decided to stop by and check your blog out. It only took a couple of sentences and I decided to follow your work. You are welcome to stop by. I think you won’t hate what I write. Are Puritopians On The Left As Dangerous As The Tea Party? National Review Online: Netanyahu, Not Obama, Speaks For The U.S.A.